My main form of socialization with my friend Dekalb is now couponing. It used to be fixing things around the house, but now that repair and handiness is his full-time job, he no longer seems to think that helping me finish my basement is a fun way to spend an afternoon. So on Saturday – after two days of riding in a car from Texas – I decided to stretch my legs by biking with Dekalb to CVS. I had a $4 off of $20 in groceries coupon from a CVS magic coupon machine near Dallas and was thinking about combining it with manufacturer’s coupons to stock up on almonds (which were on a two-for-one sale through Saturday), coffee and cheese curds. I also thought I’d see if there were enough Aussie and Herbal Essences products in stock for me to do a money-making gas card deal that I learned about from Frugal Suz. In short, you spend about $30 on hair products, use $24 in coupons and get back a $10 gas card. I don’t have a car, but Dekalb helped take care of my cats while I was away so I thought I could get the gas card for him as a token of appreciation. The trip went much better than planned. First, when I went to the magic coupon machine (always my first move on a CVS visit), it printed out not one, but two $5 off of a $25 purchase coupons. Then, we went to the haircare aisle and found that CVS had tons of stuff in stock – enough for both Dekalb and I to do the deal without us coming close to clearing the shelves. We spent a lot of time sniffing the shampoos and styling products as if we were buying them for ourselves. (In truth, almost all are going to friends and being donated.) We each selected 6 shampoos and 6 styling products priced at 2/$4.97. I also picked up two cans of Blue Diamond almonds (they were on a 2-for-1 sale) for $4.19 and a small box of single-serving decaf instant coffee packs for $1. I had $1 in coupons for the nuts and $0.75 for the coffee. I decided not to rack up $20 in groceries, since I had the $5 off of $25 any purchase to use. Then, the moment of truth: I brought everything to the register. When all was said and done, I used $26.75 in manufacturers’ coupons, a $5 CVS coupon, and $5.68 in Extra Bucks to get everything for $0.00 in cash. I got the $10 gas card for Dekalb and a $1 Extra Buck for using my own bag over the past four visits. Like I said, an awesome day for free stuff at CVS. 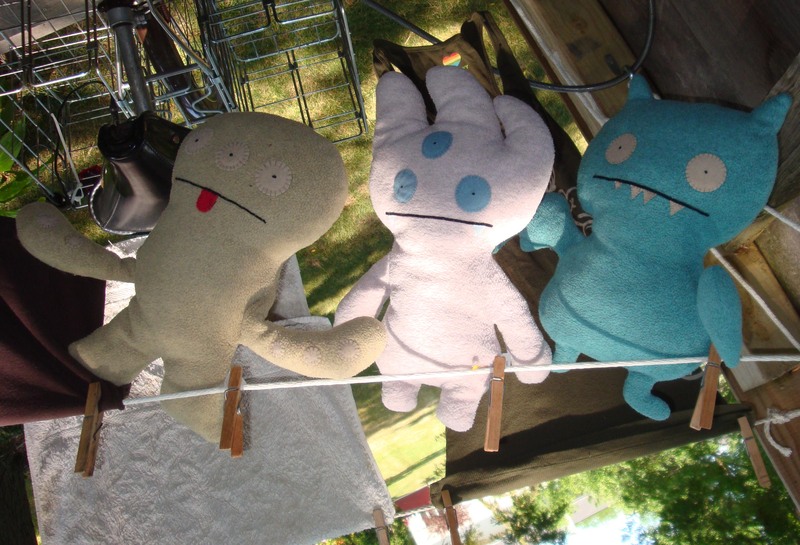 What the Ugly Dolls look like if you levitate upside down outside my back door. After leaving Dekalb at his house, I happened upon a pile of garage-sale leftovers at the curb. My curb-shopping policy is to take first what I can definitely use myself, take second what I think a friend would like, and take third what catches my fancy. The fancy-catchers might be clothes that I like but am not sure will fit, or books that look interesting, or just things that are weird/cool. They usually end up being donated to St. Vinny’s or sold to a bookstore or on consignment. I was on my bike so I couldn’t take everything that was cool, but I got three Ugly dolls, two 12-foot-laundry-lines worth of clothing, an unused leather photo album, a rectangular basket (always looking for these to make my stuff on shelves look neater), some children’s books in German, a CD of German comedic music, and an organic chemistry modeling set. I put most of the finds in a large duffel bag I also found on the curb and stuffed everything else in my bike baskets (along with the CVS treasures and a small compost container I had emptied at Dekalb’s) and on the top of the rear rack, then headed home. I love my Schwinn Suburban. I hadn’t even gone a block before finding a new home for the chemistry modeling set. My friend A., who happened to be in the neighborhood, waved hello from the curb. I pulled over to visit with her and offered her the set. She’s in nursing school and will be taking organic chemistry next semester. So now it’s hers. Serendipity! I stopped by the same curb pile, and I grabbed something from it. It must have been rather bland cuz I don't remember what it was. I biked past the pile a few hours later and noticed it had been neatened up and organized into catergories. 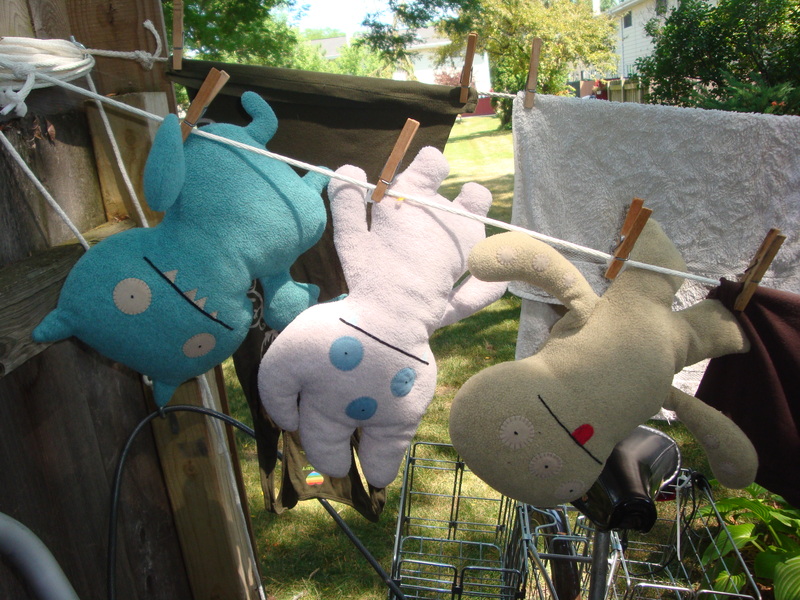 Someone had some extra time to kill... Those ugly dolls certainly are cute. Good score! Would you like an Ugly Doll? Why yes, I think I would.